VIENNA, Austria (CNN) -- The chief of the United Nations' nuclear watchdog agency sounded less optimistic after Tuesday's meeting on Iran's nuclear program than he had after Monday's meetings. 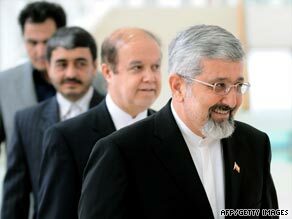 Ali Asghar Soltanieh, Iran's Ambassador to the IAEA, arrives for Monday's talks in Vienna. "We still hope to be able to reach an agreement," said Mohammed ElBaradei, director general of the International Atomic Energy Agency. "It is a complex process, as you understand. There is a technical aspect, many technical issues that we have to hammer out. "There is of course the question of confidence building, guarantees. I think and I believe that we are making progress. It is maybe slower than expected but we are moving forward." After Monday's first round of meetings, ElBaradei emerged to say that "most of the technical issues have been discussed." "We had, this afternoon, quite a constructive meeting," he said. "We're off to a good start." Delegations from Iran, France, Russia, the United States and the IAEA are meeting in Vienna this week to work out details of a tentative deal reached in early October. That deal calls for low-enriched uranium produced in Iran to be sent abroad for further enrichment and then returned for use in medical research and treatment. Low-enriched fuel has the potential of being further enriched into weapons-grade material. Iran will send its low-enriched uranium to Russia. Russia will then further enrich it, but keep it below weapons-grade, and send it to France. France will prepare the uranium for use in nuclear reactors by fabricating it into metal rods and send them to Iran. Iran will then use the rods in its nuclear reactors. But on Monday, Iran's state-run media said Tehran had ruled out France as a country from which it would purchase the enriched metal rods. The French Foreign Ministry refused to comment on the matter until the talks conclude. CNN's Matthew Chance in Vienna, Austria, and Per Nyberg in London, England, contributed to this report.